Hmm…I kinda don’t like the greeting my posts have. It’s like I’m a presenter on some monumental stage and have a million people staring at me..uh. Not happening. Anyway! My take: THIS is the kind of book that I would sit down and read in one go. Not because of how thrilling it is but because of the wonderful way in which it is written which doesn’t make the writer feel as if they are on a past-paced journey towards a climax, but instead takes them from page to page laughing out loud and thoroughly interested with what was going to happen next to the character. 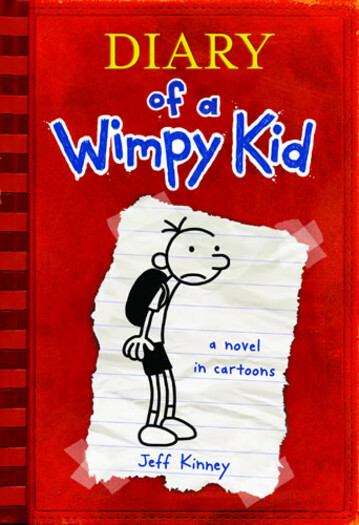 The book is the first one in a series of six (I will be sure to follow them all) and is narrated by Greg Heffley, a sarcastic, wise-cracking “wimpy kid” living his oh-so-troubled life in middle school with his best friend Rowley who is an innocent friend, not at all “cool” according to the standard of the school. 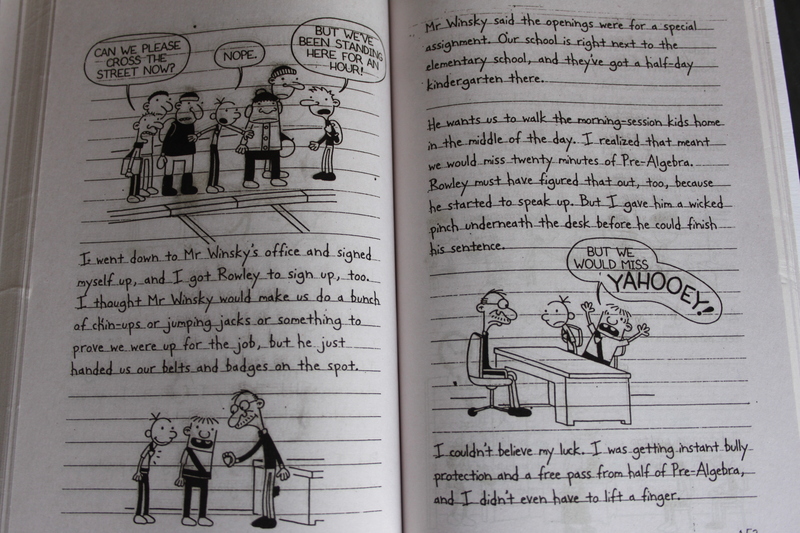 Greg is one who continually tries to direct away the bullying and such which is part of middle school and rise to higher echelons of popularity. The book comprises of 217 pages and I was laughing out loud at more than half of them. The narrative is full of sarcasm and irony and one can easily relate to the middle-school experience. The illustrations really bring the punchline in many jokes and are a great way to make the reading experience richer. 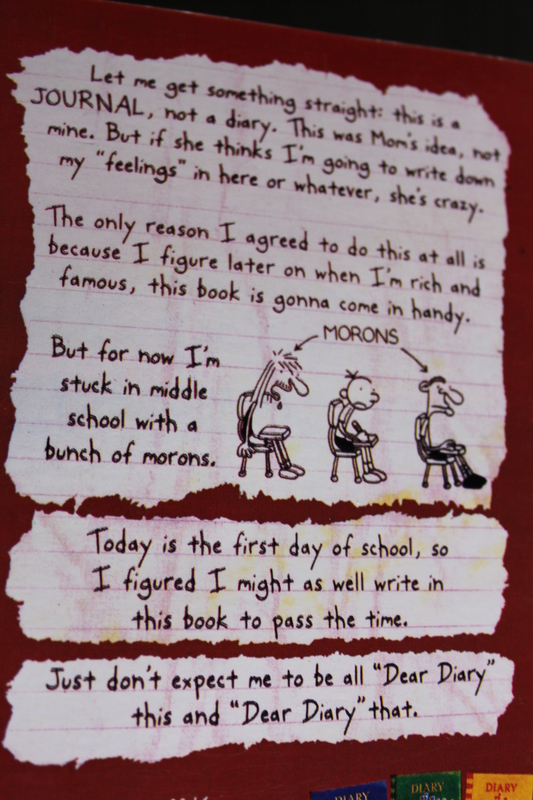 From being acutely embarrassed of the nickname “Bubby”which his little brother gave to him, to being caught and ridiculed doing something silly by his older brother Rodrick, Greg is something of a magnet to hilarious situations. His high ideas to attain wealth and fame get him more trouble and get more laughs out of the reader. A lot of people ask of how to become readers and get into the habit of reading regularly, and I advise them to start with something like this: a light, hilarious book to keep them entertained and show them what a book brings to the reader. You appreciate books about middle or high-school humour. You would enjoy having illustrations aid the text. You’re trying to become a more regular reader. Also, children 9+ would enjoy this book a lot. You are not one for humour. You do not like early-teen literature.